Watch Jeremy Dutcher powerful speech for unity and reconciliation at the 2019 Juno Gala Dinner. Jeremy Dutcher, who won a Juno for Indigenous Music Album of the Year at the 2019 Juno Gala Dinner & Awards, made an unexpectedly powerful acceptance speech on Saturday night. In it, he not only thanked everyone for the win, but also mentioned Prime Minister Justin Trudeau’s stance on the Trans Mountain pipeline, and raised questions as to why there are still communities on boil water advisories in 2019. As he was just about to talk about reconciliation, he was promptly cut off at the maximum 60 seconds acceptance speech time. 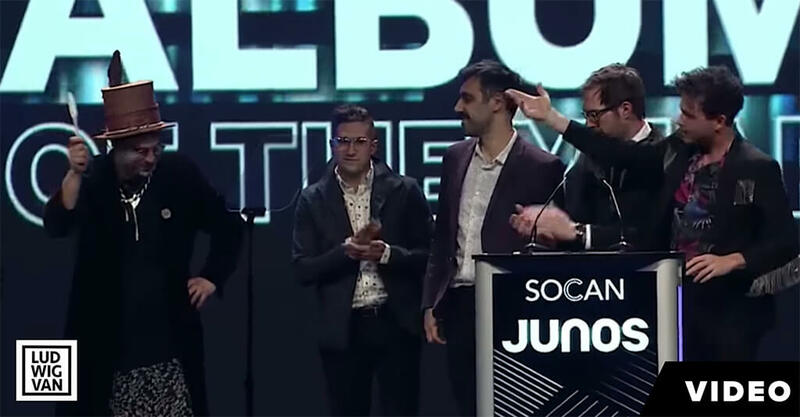 It wasn’t until the Arkels came up on stage after winning for Rock Album of the Year, that they offered their allotted acceptance speech time to Dutcher so he could finish what we wanted to say.